Understanding Weather and Climate 6 Edition Rising interest in climate change and severe weather phenomena are making meteorology courses more popular than ever–yet this fast-paced, one-semester curriculum is packed with complex physical concepts that can be challenging. 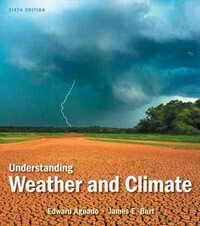 In Aguado/Burt’s Understanding Weather & Climate, a first-rate textbook and inspired technology tutorials combine to engage students in learning about atmospheric behavior. The authors use everyday occurrences to illustrate meteorology and climatology. Dynamic illustrations from the book come to life in the new fully integrated MyMeteorologyLab website, where students have access to a variety of media and self study resources such animated tutorials, videos, and satellite loops of atmospheric phenomena. While staying true to the text’s rigorous and quantitative approach, the Sixth Edition incorporates the latest new science and issues, new technology and media to help both teach and visualize the toughest topics, with a more learner-centered architecture and design.